Come fall, after the wood has stood in the sun and wind all summer, it needs to be brought in under cover to a convenient location for winter use. And you'll want to arrange the supply to minimize effort and mess. After all, once the work of preparing your fuel supply is done, wood heating should be a pleasure. Storing your fuel wood supply inside a building is a really good idea, but only after the sun and wind have dried your wood to below 20 per cent moisture. Firewood will not dry well when densely packed inside a building, so dry it first outside. After letting it stand out in the open for the summer, storing your winter’s wood inside will keep it dry and make it more convenient to bring a day or two’s supply into your house. A woodshed is an uninsulated building, usually attached to the house. Some are designed to have air movement through the building, usually under the eaves, but this is not terribly important if the wood is properly air dried before being put into the shed. the shed should hold at least a year’s supply of wood for your home. enough room to allow a bit of wood splitting inside; it’s pretty common to need to make some fine kindling or split a few firewood pieces during the heating season. Here is a plan for a funky wood shed, along with some photos of nice sheds built by our readers. Having the shed on the same level as your wood burner can save a lot of effort in transferring the wood - something that increases in importance as we age. 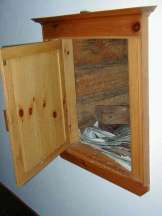 Some people have a door from their wood shed strategically placed so that they can pass wood directly into the wood box inside. This saves a lot of steps and heat loss because this small door is not opened nearly as much as the "human" door to bring in a couple of days’ supply of wood. This is the door to the wood box, viewed from the wood shed. And this is the same wood box viewed from inside the house. A very slick arrangement. Some people who can’t have their woodshed on the same level as their stove use a wood elevator to move their fuel upstairs. The elevator basket forms the wood box when raised into position near the stove. This is a good alternative to carrying wood upstairs, although it can be expensive. Here is a wood elevator being loaded from wood storage in the basement. And here it is in its normal position upstairs beside the wood stove. What if I don’t have a wood shed? If you don’t have a wood shed to keep wood dry and close to the house, you could stack it on your porch, or under the eaves. You’ll need to cover this tightly packed pile completely - sides and top - with a tarp or plastic. It’s a good idea to stack the wood on pallets or rails to keep it off the ground or porch floor so that it won’t freeze in place or attract surface water into the bottom rows. 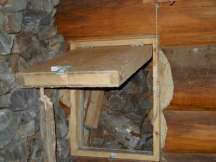 It is generally better to store no more than a week or two’s supply of wood inside the house. The frequent cycling of the indoor supply lets you check for and control bugs better than if you attempt to store most of the winter’s supply inside. While some people worry about bug infestation, my experience is that bugs are not a problem at all if the wood is properly processed and seasoned before being brought indoors. While storing too much inside is not recommended, storing too little can be a problem as well. It's a good idea to have at least a day’s supply inside the warm house to avoid shocking a fire with icy cold wood. Warmed up wood will ignite more quickly, and the fire doesn’t have to expend valuable energy to bring the logs closer to combustion temperature. You’ll need a wood box close to the heater, although not closer than the appliance’s minimum installation clearances. Wood boxes can be built in, freestanding, or on wheels for easy moving. A good wood box will hold at least one full day’s fuel. The handy wood box gives easy access to a variety of wood piece sizes to fit into the stove in different patterns to achieve different goals, like a compact load for a long burn while away at work or a loose load of small pieces to quickly warm the home after returning from skiing. One of the biggest criticisms of wood space heaters and fireplaces - as opposed to basement furnaces - is the mess, bugs and dirt that heating with wood brings to our clean, modern homes. The utilities make much of this point in advertising their simulated fireplaces. For most of us though, the potential for mess is easily managed. Mind you, those who cover their furniture with clear plastic shrouds and don’t let the kids in the living room might be more comfortable with the artificial ambiance of a manufactured fire. Wood mess can be eliminated with just a little planning. Properly dried wood has been moved from the drying area to the wood shed or other spot close to the house. By the time the firewood is ready to be brought into the house much of the bark and wood chips are left behind. The loss of bark is just fine because bark has a low heat value and tends to hold dirt and chips. As well, most bugs hang out under bark, so most of these too are gone with the bark. This sloughed off bark should be land filled or used as mulch in gardens. There are a variety of carriers designed to make hauling wood from the shed to the wood box easier and neater. Wood carriers are usually tough canvas bags with handles and cost about $20. They are a good investment because they let you carry a load of wood without scuffing your wrist and forearm and getting chips on your clothes. Another necessity for neat and tidy woodburning is a practical set of tools. The best tool sets consist of a rake, a broom and a shovel. The rake is for managing the coal bed and the broom and shovel are for sweeping the hearth clean. A quick pass with the broom, catching the sweepings in the shovel and flipping them back into the fire is a routine that takes place several times a day in a neat wood heated house. It’s no big deal, but without the right tools, it can’t be done well and the result is a messy hearth.